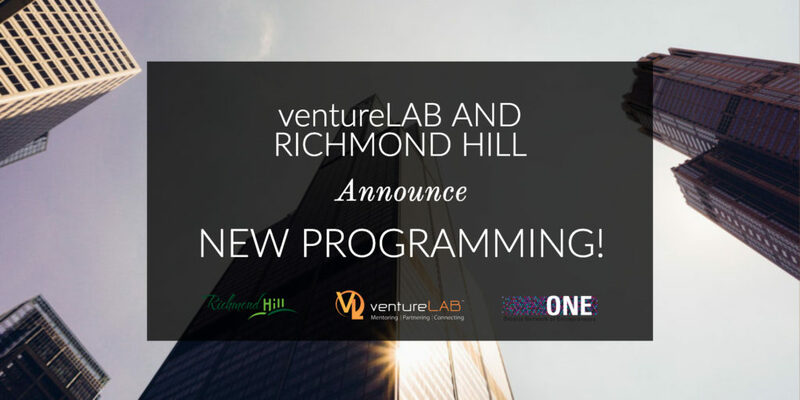 Richmond Hill and ventureLAB are excited to announce they are bringing programming for innovative entrepreneurs to Richmond Hill. Richmond Hill is home to disruptive innovators and part of Canada’s largest technology cluster. ventureLAB is York Region’s Innovation Centre, and has supported over 2,000 tech entrepreneurs since 2011, helping close to 100 companies raise nearly $100 million in private and public investment. ventureLAB will be holding orientation sessions for innovative entrepreneurs in Richmond Hill on May 3 and June 21 (stay tuned for registration link). Join us for an orientation session in for an overview of ventureLAB-Richmond Hill programs and services. Founders of innovative companies at all stages interested in launching, growing, and scaling their business should attend a session.